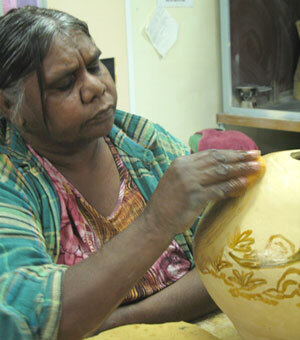 Internationally recognised potters from central Australia have been honing their techniques at Charles Darwin University’s Alice Springs art facilities. Eight of the women who make up the group known as the Hermannsburg Potters, based at the community (also known as Ntaria) west of Alice Springs, have just completed a week-long design course on site. They developed new surface treatment for their world famous hand-made terracotta pots which are sold and exhibited throughout the world. Many pots fetch five figure sums on the international market. A rush on the pots before their display at a recent Melbourne exhibition is typical of the group’s popularity. Most of their work reflects Dreamtime and bush food themes, and features vibrant figures of birds, animals and lizards sculptured on to the bodies and lids. Hermannsburg, a former Lutheran mission is home to the Arrente community and birthplace of the famous artist Albert Namatjira, who, like the potters, was influenced by the teaching of art skills at the mission. Contact with CDU was initiated after the women decided to further their skills during the re-development of their Hermannsburg pottery. Through informal channels, CDU art lecturer Henry Smith and the group’s manager, Dr Margaret White, established contact and explored training options. Art lecturer Suzi Lyon eagerly agreed to work with the women and a custom program was developed exploring ceramic and printmaking techniques which could be applied easily to their works. Dr White described the program as a success with the women enjoying their time and gaining many new skills. “Suzi was outstanding in how she worked closely with the potters and we are very grateful for her support,” she said. And Suzi said she valued her time with the women. Potter Heidwig Mokebaringa said she enjoyed her time at the university. “Suzi shows us the different styles of painting. I really like being here learning new things,” she said.